From the 14th to the 16th centuries Brunei Darussalam was the seat of a powerful sultanate extending over Sabah, Sarawak and the lower Philippines. Thus, the current Sultan represents one of the oldest continuously ruling dynasties in the world. By the 19th century, the Brunei Darussalam Empire had been whittled away by wars, piracy and the colonial expansion of European powers. In 1847, the sultan concluded a treaty with Great Britain and in 1888 Brunei Darussalam officially became a British protectorate. 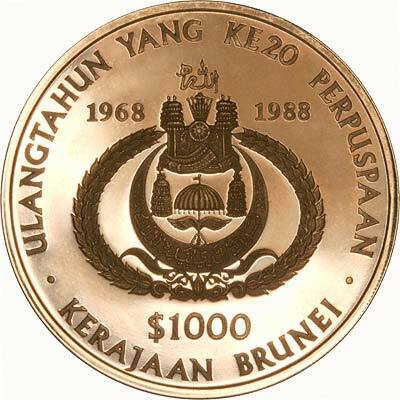 In 1906, the Residential System was established in Brunei Darussalam. A British Resident was nominated as a representative of the British government to advise the sultan in all matters except Malay customs, traditions and Islamic religion. 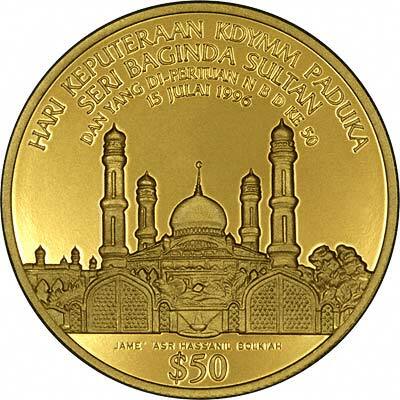 Although Brunei issued its own coins as early as 1285 AH (1863 AD), there was then a gap until 1967, and it issued no gold coins until as recently as 1978. 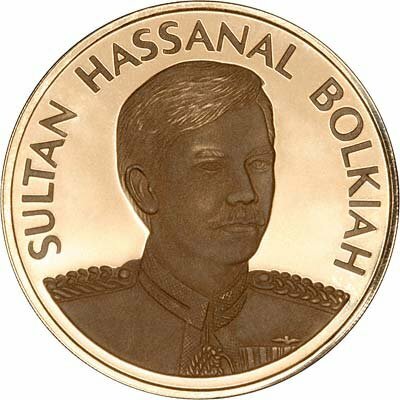 The obverse has a coloured portrait of the Sultan of Brunei, Haji Hassanal Bolkiah. Minted by Huguenin Freres of Le Locle Switzerland. 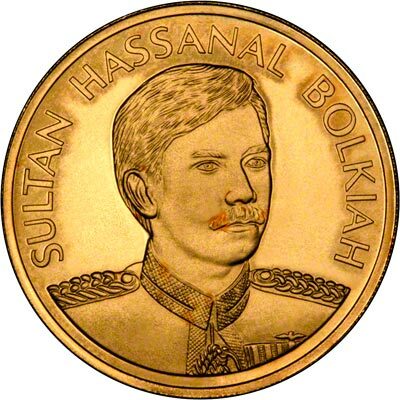 * The certificate which accompanies the coin states the gross weight to be 31.1 grams, Krause gives it as 31.1035 grams, and we weighed our coin at 31.1446 grams; so far, so good, as this is within reasonable tolerance limits, but... The certificate states the alloy to be 22 carat gold, and Krause states .9170 fine, which once again mean the same, within reasonable tolerance. Krause then states the "AGW" (Actual Fine Gold content) to be 1.0000 troy ounces. If the certificate and Krause are correct about the gross weight and alloy, then the actual gold content would be 0.9167 troy ounces, and this is a reasonable assumption, however it's our guess that Krause may be correct about the AGW, and that the certificate (and Krause) have stated the alloy incorrectly as 22 carat (.917), and that the actual alloy is .9999 or possibly .9990 fine. The coin is a very pale yellow colour, very similar to fine gold, so this latter assumption may be the correct one, however, if an alloy of 22 parts gold, and 2 parts silver was used, this would also produce a similar pale yellow colour. 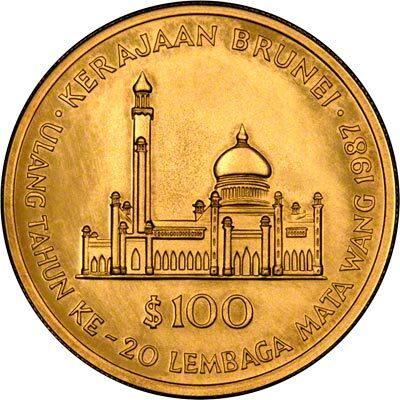 Most other Brunei gold coin issues have been 22 carat gold, but a $1,000 issued in 1994 was produced in .9999 fine gold, so this gives no clear indication of which alloy was used for the 1996 issue under discussion. We will attempt to discover which version is correct, but this may take some time. 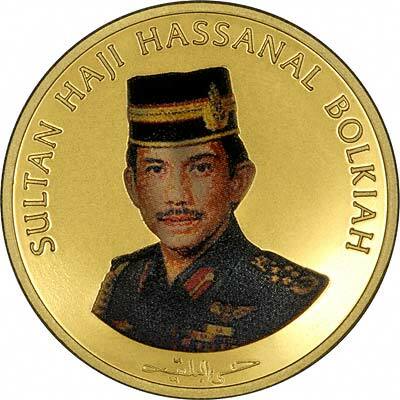 For silver and base metal coins of Brunei, please look at our original Chard Coins website.